It is now just over one hundred years since the United States entered the First World War on the side of the Allies in one of the most unnecessary and wasteful wars ever fought. What and who were responsible of the war? The simple answer is the international bureaucracies and the heads of state of all the nations involved. The cost of this war in life and material was unprecedented. The war changed the face of Europe and the United States. For the European states it began their socialist, moral and demographic demise. The war reduced the former Western Christian patriarchal societies into disordered secular chaos, where freedom was confused with equality and Christianity debased. For the United States, still not fully recovered from its own War Between the States, it transformed the nation into a world power, steered by American progressives lead by President Wilson. In any case the world was not made a better place anymore than the Great War was “the war to end all wars”. The result was to see a century where warring states would kill more people than all the centuries that came before. This made the scandalized wars of religion pale to nothing compared to those of the secular twentieth century. However, that is not what this book is about. It is about a fascinating period worth evaluating. This book is about the First World War’s technological advances and the related tactics exemplified through a historical game system. 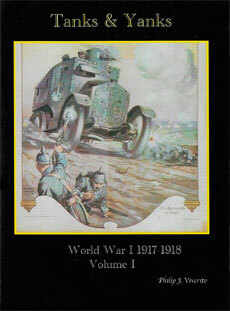 Tanks & Yanks (Deluxe and Volume I) focus on the later part of the war, circa 1917-1918, for the miniature historical gamer. Specifically Tanks and Yanks focuses on the two last great offensives of the war -- the German Kaiserschlacht (Kaiser’s Battle) and the Allied Hundred Day Offensive. The War had become more fluid. The study of warfare and bloodless miniature games can be important. Respecting the misery, and honor, the horror and success of those who fought and suffered in the worst of conductions should never be forgotten. First then, this is a study of mankind in the worst of circumstances. Second it is a recreation of WW I warfare in miniature; teaching problem solving. Finally there is the pleasure of collecting and using historical miniatures. It may be debatable about the actual value of Pershing and the A.E.F. It is not debatable about the result of our intervention into the war; victory. American manpower grew and American tactics quickly developed to deal with the dramatic power of the weapons employed. Our allies guided our troops in many different ways through the war. From this guidance the Americans were able in no small way to assist the Allies in overpowering the Central Powers. The research required almost got in the way of the game system, with color, diagrams and illustrations. Consequently after many rewrites it was decided to create the Deluxe (including both Volumes I and II). Volume I is the game system and Volume II a simple note book; it did seem necessary to describe the tactical techniques in some great detail. Volumes I and II over lap each other. Fortunately there is plenty of information on how these weapons were used on the battlefield. This availability of information made it possible to transform information into a realistic game system. The game system includes supportive diagrams, illustrations, tactical notes and Quick Reference Sheets (Q.R.S.). The Turn Sequence and Turn Phases, once understood, make play easy and fast. The system has two Turn Sequences one of which is optional and the other mandatory. Six basic Turn Phases move the game along to a conclusion. Manufacturers will be glad by the fact that the game is best played using lots of figures and models. Let us be glad that there are sources for figures and models. Basic units are 12 figures for a platoon with four platoons making a company and three to four companies making a battalion. Figures can be mounted individually or on multiple stands. Morale is based on unit size and applicable modifiers. Movement is with a D-10 die roll for both infantry and tanks. Transport and field artillery movement is determined by the roll of a D-6. There are two Turn Phases in which players can shoot. Hand-to-hand combat is easily performed. Players are always encouraged to adjust the rules to suit their perceptions. To me, Tanks and Yanks captures the flavor of the late war. I hope your games will be hard fought, yet fun, and the game system competes well with other similar systems. This book, Volume II, deals with the information used to create the basic game system; the War’s technological advances and the related tactics exemplified through a historical game system.